Do you have a little boy whose birthday is coming up? If so, you might be looking for nice birthday quotes for a little boy! 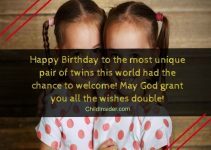 This page is where you can find happy birthday quotes for little boys and more! Little boys usually prefer simple birthday wishes, but you might find yourself several little boys who like nice and meaningful ones. Whatever the case, you will surely be able to find some inspirations for little boys’ birthday wishes here. Little boys are active, playful and perhaps even a little on the rough and noisy side for some! For these different personalities and styles, there could be different birthday wishes that can suit the little boys. Why not take a look at all the happy birthday little boy wishes that we have for you below? As it is for most birthday wishes, you should personalize the birthday wishes for these little boys so that they feel more genuine! 1. When I asked God for a little prince to brighten the world, you came along and brought me joy ever since. Happy birthday, little one. 2. As each year passes, I look forward to seeing you grow up stronger and smarter, but most of all, I wish that you will always be loved..
3. It’s only your third birthday, but I am so baffled at how quickly you learn to walk and to talk! Happy birthday my dearest boy. 4. Hey kid, happy birthday! You deserve the most fun-filled and happy birthday, overflowing with all the love that we can give you. 5. A special kid deserves a special birthday celebration, and for your awesomeness, we’ll make your birthday party this year full of fun and sweetness! 6. Happy birthday little one! Sweet stuff are not good for you, but on your birthday we’ll make an exception for you! 7. Here’s to another great birthday to the coolest kid around the block. Happy Birthday! 8. Have an awesome birthday little one! May this year bring you joyful achievements and wondrous discoveries! 9. Here’s to more adventures to be had. Have a superb day and a fun-filled year all year round, kid! 10. Today is your day, so put away your homework and enjoy your birthday celebration! Make the day memorable for you. 11. Thank you for giving me endless reasons to smile, little one. Happy birthday to my bright ray of sunshine! 12. You’re so special in more ways than just one. We wish you a birthday just as special. If not more! 13. However old you’d be each passing year, know that I will always love you. Happy Birthday! 14. The moons, the stars and all the other planets must have been dancing on the way that you were born. Happy birthday, little sunshine! 15. On your big day, we wish you the happiest, brightest future that you can have. Happy birthday, you amazing, charming little boy! 16. Aren’t you just the sweetest child anyone could ever know? Enjoy your birthday, and we hope you like your gifts! 17. Happy birthday, cutie pie! We wish you a beautiful day, filled with never-ending blessings and love! 18. Laugh, play and dance around today little child. It’s your day, and we wish you nothing but the best! 19.So little, but so full of hope, So innocent but still so dope. Happy birthday, buddy, we love you! 20. Sweet little boy, I hope your birthday will be as sweet and joyous as you are with your loved ones celebrating with you! 21. May this day be filled with lots of fun and special moments so that you can smile and be happy all day long. Happy Birthday! 22. It wasn’t easy to choose the right gift for you, because we all wish to give you the best in the world. Happy birthday! 23. The grandest happy birthday celebration to the best, most loving child in the whole wide world! I wish you courage and faith to face all your future challenges. 24. My angel, my sweetheart, for your special day I hope that all your wishes and dreams will come true! 25. It’s your special day, so you have an equally special permission to be more annoying than you normally are. May you have a partilicious and delicious birthday celebration! 26. May your 5th birthday be exciting, filled with wonderful surprises and wonderful, unforgettable moments that you’ll still remember the whole year through! 27. Plenty of people will be thinking of you on your special day today, but know that none of them will love you like we do. Happy birthday our little angel! 28. I wish to give you a big, loving hug on your birthday! Happy birthday, you sweet little angel! 29. No words can express just what we wanted to tell you about how special you are. Happy birthday, our dearest angel! 30. I wish you happy birthday from the bottom of my heart, because that’s where all the great wishes start. We wish you the happiest of birthdays! 31. Happy birthday to the most charming little boy that I am grateful to have met. Enjoy your day, young one! Happy birthday, to my baby boy! 33. Happy birthday to the cutest boy ever! We are the proudest and happiest parents on Earth! 34. Happy birthday, my boy, I hope you’ll grow up to be a fantastic young man! 35. We wanted to wish you love and health, but all you wanted was a toy – Happy birthday to the sweetest boy! 36. May your days be filled with love, and may you grow stronger, wiser, and funnier! Happy birthday, little boy! 37. Happy B-day to my favorite little guy! I hope this year you’ll finally learn how to make your own bed! 38. Your careless spirit inspires me, and your energy keeps me going every day. I love you forever, my boy, happy birthday! 39. Happy birthday to the most perfect little boy, who will one day grow up into a true heartbreaker! 40. Happy birthday to my little buddy! I love seeing you grow up in front of my eyes, happy and blissful! Have great fun on this birthday. Happy birthday to my favorite little boy! 42. Happy birthday, precious boy of mine! You have made us the luckiest parents in the world! 43. Another year of watching you grow makes me the happiest person on Earth! Happy birthday, little guy, we’ll love you until the end of time! 44. Happy birthday to this little fella who doesn’t like listening to his big sister! We wish you a lifetime of love and happy memories! 45. You push my every button, but you also give the best hugs and kisses in the world! Happy birthday, little boy, and all the best! 46. You are the brightest boy ever, and it is a privilege calling you my son! Happy birthday, little angel, I love you so! 47. My boy, as much as I hate seeing you grow up so fast, I love watching you take the world by a storm! Happy birthday and all the best! 48. A few more years, and you won’t be a little boy anymore! Happy birthday baby boy, we love you immensely! 49. Happy birthday little guy, I wish life brings you the same joy and happiness you bring to us all! 50. Happy B-day to the funniest, cutest, and happiest little guy I know! Your magnetism and will to live inspires me daily! 51. Happy birthday, sweet boy, I hope your life is always filled with precious memories and lots of adventures! 52. Your giggle makes my heart tickle with joy! Happy birthday my little boy, my life made no sense before you! 53. Happy birthday to my caring little boy! You make my mornings smooth, my afternoons delightful and my nights peaceful! 54. You may be little, but you have the biggest and most loving heart I have known! Happy birthday, lovely boy, may you have it all! 55. Another year has gone by, and you keep getting cuter! Happy birthday to the best little boy in the world! 57. You may be growing older, but to me, you’ll always be that kind and loving little boy that has my heart forever! Happy B-Day sweetie! 58. Happy birthday, little guy, I love you more than words can say! P.S. Stop growing so fast kid, please! So innocent but still so dope. Happy birthday, buddy, we love you! 60. To the boy whose smile can conquer the world – Happy birthday little guy, we love you endlessly! We hope that these happy birthday little boy wishes have inspired you to write your own for his birthday. If you are out of ideas, you can even combine several of our birthday wishes together into one small paragraph. Remember to bookmark our page to keep up with the latest birthday wishes and other content that we provide!